The most exciting thing in recent years is that more gardeners are growing for wildlife. Wildflower peepers love Indian blanket (Gaillardia pulchella), but so do the bees. We’re conserving water, too, with natives and adaptable sidekicks. In this garden designed by Robert Leeper, gray santolina on this hot curb plays nicely with South American moss verbena and native Salvia greggii that attract lots of bees and butterflies. Bees are flocking like crazy to Newe Ya’ar sage. I’m even seeing it on heavier soil, so I think I’m going to try this culinary herb at home. In my garden, Gulf Coast penstemons are HUGE this year—and a huge fan with bees. This week, see how nectar and pollen support diverse wildlife with Andrea DeLong-Amaya from the Lady Bird Johnson Wildflower Center.She joins Tom to explain how carbohydrate nectar provides instant fuel, while pollen contains amino acids and protein to feed baby bees. Although most butterflies only go for nectar, the Zebra Longwing chows down on pollen, too. We eat all year and so do the wildlife. In spring, penstemons like Hill Country penstemon attract bees and hummingbirds. Here’s P. cobaea in my garden, joined by heirloom, passalong Byzantine gladiolus. Late spring and summer native datura attracts night-flying moths and daytime bees. I’m giving purple Datura metel a try. Andrea explains why many of us don’t have luck with fall-blooming bulb Liatris. But if you’ve got the right spot, like this front yard prairie in Williamson County, migrating hummingbirds and Monarchs will love you! Salvias cater to lots of customers: bees, hoverflies, butterflies and hummingbirds. Plus, there’s one for every season from spring through frost. Andrea explains how the tubular shape prevents nectar from washing out in rain, like on my spring-blooming native Salvia roemeriana. Many plants attract hummingbirds, like spring-blooming Aloe maculata, here with bluebonnets (that attract bees) at the Rollingwood City Hall/Police station in a garden designed by Lauren and Scott Ogden and Patrick Kirwin. Even though I grow native Turk’s cap all over my garden, the easiest spot for viewing them is on the “hedge” of Turk’s cap against my patio. My husband snagged this picture one evening. We can supplement with feeders, too, but to do it correctly, John Dromgoole has tips for you this week. Check out Hummingbirds of Texas to find out more! We also grow food for ourselves. Viewer Picture goes to DeWayne Nash and his wife who build cinder block vegetable gardens at schools and this one at the Habitat for Humanity house in Williamson County. What great volunteers! Although crape myrtle trees aren’t native, their flowers do attract bees, wasps and aphids that feed ladybugs. But how do you prune them, asks David Slevin? Daphne explains how, and applauds David’s pruning of his young ‘Tonto’ crapes. Here’s some great tips and drawings to prune shrubs and trees. Need a native, drought defiant groundcover in deer country? See how to grow Woolly stemodia (Stemodia lanata), Daphne’s Plant of the Week. Botanical Concerns’ designer Annie Gillespie and associate Rachael Beavers covered a lot of ground with woolly stemodia in this rocky hillside front yard, our tour garden this week. For continuity on the other side of the driveway, they planted woolly stemodia along with artemisia, yuccas, and four-nerve daisy and lantana for butterflies and pollinators. When Sandi and Bob Tomlinson built their 5-Star Austin Energy Green Build home, they wanted to live outside, too. 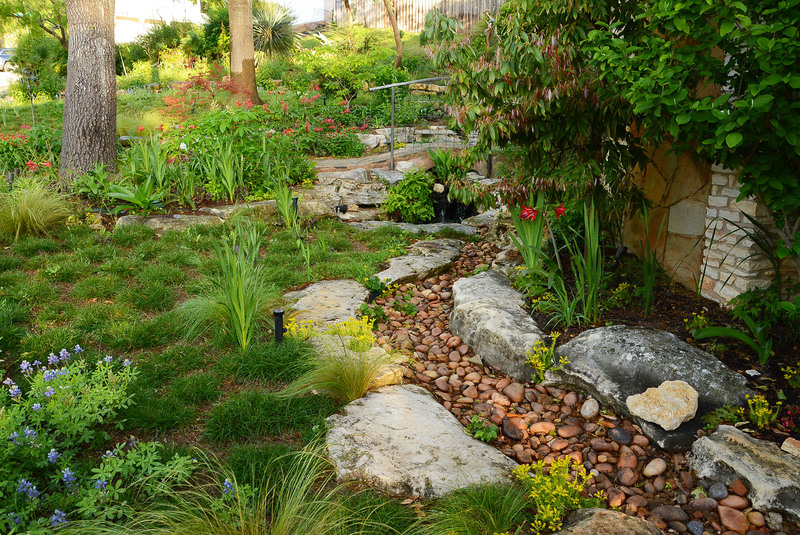 The garden design had strict guidelines to match, including limited impervious cover and water retention on the slope that drains into Lady Bird Lake. After grading for patios and walkways in back, Rachael and Annie covered many spaces with gravel to sink in water. Annie’s water control starts in front. Rainwater rushing from the street filters through a gravel pathway to the back. There, it’s directed to a dry creek bed. It all ends up in an 8’ wide, 4’ deep filtration trench. In front, Annie & Rachael not only slowed down water. They wanted to slow down the walk through the garden to the front door. On this pathway, water sinks in, while textural plants match the clean lines of the house. Annie and Rachael left the native shrubbery and trees for this serene front yard gathering spot. There’s so much more so take a look right now!